So I made this scrubber and have had it running since October 18th... I have the water flow coming from my filter. The scrubber is powered by 4 gem 5 lights. I initially had the lights in a pair together concentrated on the center but have since spread them to form a “+” sign. Anyways, it looks like it’s filling in well. I rinsed it under tap water yesterday agitating it with my fingers and almost none of the algae came off. Am I on the right track with assuming the center is burned out and spreading the light pattern like i did in the picture can help with the problem? Looks like you have a Green Grabber screen in the pipe slot, and the bucket is a white plastic one covered with foil tape to keep the light inside. Since you are running in freshwater, it will fill in easily. Not sure if the GEM5 lights are in the position before or after you said you moved them, but the position in the picture is ok for now. Since you are using the suction cups for mounting, you can move them easily later if needed. The growth is dark, so you need to use a toothbrush to clean all of it off in your sink, including the holes in the screen. It's probably then going to grow fast and long, so post another picture when the screen is thick and long, and we'll see if the lights need to be moved again. Thanks for the reply SM! Does the lack of growth in the center look like it’s due to too much light? The picture I posted with the lights running is how it looks after I repositioned them. Do you recommend running just two strips with the growth being young and turn all four on when it picks up in density? Or should I just leave all four on and see how things look in a week... these lights and green grabber screen really are amazing! Thanks for making such a quality product! Glad you like it. Just leave it the way it is; it should fill in nicely. Sooooo just wanted to update... the algae has grown in fantastically. This picture is from one week ago. My nitrite levels are now registering in the orange(<20), which has never happened in this tanks life. I haven’t done a water change since cleaning the screen a week ago and hopefully won’t have to for a long long time. Quick question though, what do you recommend I do to keep water outlet slot clean aside from the normal cleanings with a toothbrush? I noticed that around day 5 the water flow starts to slow down and at dat 6-7 it’s MUCH slower. 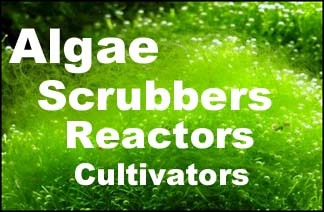 I clean it on day 7 as the scrubber throws out too many loose pieces of algae ( which my livestock does not mind). Just make a shade that covers the first half inch of the top of the screen. Can be a larger pipe over the smaller pipe, or plastic strips glued next to the slot.